O&B Athens Boutique Hotel provokes you to experience a new level of hospitality in one of the most central hotels of Athens. Walking through the mature streets of downtown Athens and hearing the mist music, laughter, art and heart. The mixture of stylish and suave design, the light strokes of class and elegance and the warm atmosphere of our O&B Athens hotel represent a new meaning of service, placing our guests in the limelight, with the aspiration to reach top quality for our guests’ experience. 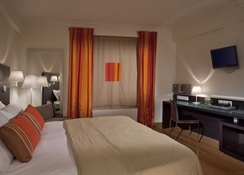 O&B Athens is a cozy 4 Stars Boutique Hotel, in the centre of Athens, a few steps from Ermou street, next to the main sites of the city and just 2 minutes walking from Thisio Metro Station. With its Acropolis Suites with private terraces and view of the Parthenon, its elegant rooms and its O&B Athens All Day Bar Restaurant, O&B Athens Boutique Hotel welcomes you to Athens and invites you to experience its unique philosophy of hospitality and care. Renovated in 2005, this hotel comprises a total of 11 rooms, one of which is a junior suite, spread over three floors. The hotel's facilities include a lobby area with a 24-hour reception desk, a safe, a lift and a currency exchange counter. The hotel is a dramatic and adventurous reinvention of the urban essence for energy, vitality and magic. It is a true haven of relaxation in the centre of one of the world's liveliest cities. With the exciting new lounge bar, it offers a stylish and relaxing environment for guests to experience which is continuously being redefined by the latest developments in design and living. One of the hottest clubs of Psiris, the Ochre and Brown Lounge, is located in a surreally glamorous world behind the hotel lobby. The bar's adobe-style walls, hand-crafted wooden floor and atmospheric lighting create an attractive environment in which to enjoy a drink. Chat or people watch in a series of snug niches that are bathed in warm, vibrant shafts of light. The lounge is ideal for private parties and events. The hotel also has its own cafï¿½, restaurant and offers Internet access (fees apply). Room and laundry services complete the range of services available. There is also a car park. The airport is well connected to the city's centre by the underground train. Take Airport-Egaleo line and go to Monastiraki. Then take the train towards Piraeus and alight at Thissio station. From there, take Ermou Street and walk 50 m until reaching the intersection with Leokoriou. Guests can also easily reach the hotel by taxi. 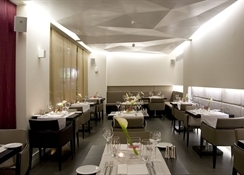 By car: the hotel is about 50 minutes away by car from the Elefhterios Venizelos Airport. Take the Attiki Odos motorway towards to Elefsina. Take the exit to Messoghion Avenue. Turn left at the traffic lights and follow the road towards the city centre. Take Vassilisis Sofia's Avenue until Syntagma Square and turn left at Vassileos Georgiou Street. Drive half way round the square and turn to the right at Mitropoleos Street. This eventually runs into Ermou St. Finally, turn right onto Leokoriou Street. The hotel is located on the left-hand side. In addition, the hotel is around 15 km from Piraeus airport. It is also easily reached by taxi. Alternatively, guests may take the underground (line 1) to Thissio station.